Different states have different rules and regulations. 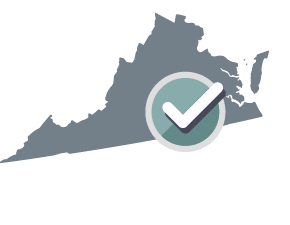 Your Deed of Trust will be customized for Virginia. In Virginia, you must use a Mortgage Agreement instead of a Deed of Trust. Please use our Mortgage Agreement contract. What is the difference between a Mortgage Agreement and a Deed of Trust?Essentially both documents serve the same purpose; the borrower is using the property as security to acquire the lender’s loan. A mortgage creates a lien on the Mortgagor’s property and that serves as security for the loan. The mortgage is between the borrower and the lender. While in a Deed of Trust, a lien still exists and serves the same function; however, a third party called the trustee is also involved. The neutral third party will hold the title temporarily for the beneficiary (the lender), until the loan is fully paid. Some common trustees are attorneys or title companies. In addition, if the borrower defaults, the foreclosure differs. For mortgages, the lender needs to go through judicial foreclosure process which takes longer. However, some states do have nonjudicial foreclosures available even for mortgages. In the case of Deed of Trust, the lender can bypass the judicial process and utilize the power of sale to sell the property if the borrower defaults. Which states use a Deed of Trust and which states use a Mortgage Agreement?The following states use Deed of Trusts: Idaho and Washington, D.C. The following states use Mortgage Agreements: Connecticut, Delaware, Florida, Illinois, Indiana, Iowa, Kansas, Kentucky, Louisiana, Maine, Nebraska, New Jersey, New Mexico, North Dakota, Ohio, Pennsylvania, and South Carolina. The following states may use either Mortgage Agreements or Deed of Trusts: Alabama, Alaska, Arizona, Arkansas, California, Colorado, Georgia, Hawaii, Maryland, Massachusetts, Michigan, Minnesota, Mississippi, Missouri, Montana, Nevada, New Hampshire, New York, North Carolina, Oklahoma, Oregon, Rhode Island, South Dakota, Tennessee, Texas, Utah, Vermont, Washington, West Virginia, Wisconsin, and Wyoming. B. Any buildings or structures on the Property and anything now or later attached or fixed to the buildings or the Property including additions, alterations and improvements located on, above or below the surface of the Property are covered by this Trust. However, no additions, alterations or improvements will be made by the Trustor without the Beneficiary's prior written consent. Any addition, alteration or improvement will be subject to all recorded easements, rights of way, conditions, encumbrances and limitations, and to all applicable building and use restrictions, zoning laws and ordinances, if any, affecting the Property. It is agreed that if any of the Property herein trusted is of a nature so that a security interest in the Property can be perfected under the Uniform Commercial Code, this instrument will constitute a Security Agreement and Trustor agrees to join with the Beneficiary in the execution of any financing statements and to execute any and all other instruments that will be required for the perfection or renewal of such security interest under the Uniform Commercial Code. This Trust will be governed by both the law of Virginia and any applicable federal law ("Applicable Law"). All rights and obligations contained in this Trust are subject to any requirements and limitations of Applicable Law. The Trustor, for value received, promises to pay to the Beneficiary, on demand, the Principal Amount, interest and all fees and costs on the terms set out in this Trust or in any amendment, extension or renewal of the Trust and any additional amounts secured by this Trust on the terms elsewhere provided for such debts and liabilities. the balance, if any, of the Principal Amount and any interest thereon and any other moneys owing under this Trust will be due and payable on April 21, 2019 (the "Maturity Date"). The Trustor will make monthly payments at ________________________________________ or at a location later specified by the Beneficiary. The Trustor will pay to the Beneficiary, on the day periodic payments are due under this Trust, a sum (the "Funds") to provide for payment of (a) all taxes, assessments and other charges against the Property; (b) ground rents or other lease payments on the Property; and (c) premiums for any and all insurance required by Beneficiary. If there is a surplus of Funds held in escrow, the Beneficiary will provide the Trustor with the excess funds in accordance with RESPA. If there is a shortage of Funds held in escrow, the Beneficiary will notify the Trustor as required by the RESPA, and the Trustor will pay to the Beneficiary the amount necessary to make up the shortage in accordance with the RESPA. The Trustor will notify the Beneficiary of all of amounts to be paid under this Section. At the Beneficiary's discretion, the Trustor will provide receipts of such payments to the Beneficiary. If the Trustor fails to make timely payments the Beneficiary can, at its discretion, make any payments for past due Escrow Items and the Trustor will be obligated to repay to the Beneficiary any such amount. The Beneficiary may waive the Trustor's obligation to pay for any or all Escrow items to the Beneficiary through written notice. If such waiver occurs, the Trustor is responsible to pay the amounts due for any Escrow Items. The Beneficiary can at any time revoke the waiver of any or all Escrow Item payments by written notice to the Trustor, and upon such revocation, the Trustor will pay to the Beneficiary all Funds, and in such amounts, that are then required under this Section. The Beneficiary will collect and hold the Funds in accordance with the Real Estate Settlement Procedures Act (the "RESPA"). The Beneficiary will reasonably estimate the amount of Funds due in accordance with Applicable Law. The Trustor agrees to pay all amounts payable pursuant to this Trust and all additional amounts secured by this Trust without abatement, set-off or counterclaim. Should the Trustor make any claim against the Beneficiary either initially or by way of abatement, set-off or counterclaim, the Trustor agrees that any such claim will not diminish or delay his obligations to make the payments as provided in this Trust. All monthly payments received by the Beneficiary will first be applied in payment of the interest calculated at the Interest Rate, and second in payment of the Principal Amount. However, if the Trustor is in default, then the Beneficiary will apply any payments received during this period as the Beneficiary chooses. If the Trustor is in default in payment of any amount including interest, interest will be payable on the interest and other arrears at the Interest Rate compounded monthly. When the Trustor pays the Principal Amount, interest and all the other amounts secured by this Trust in full and notifies the Beneficiary in writing, the Beneficiary will execute a Deed or Reconveyance and record it to clear the title to the Property. The Trustor will give the Beneficiary a reasonable time after payment in which to prepare and issue the Deed of Reconveyance. the Trustor has not done any act to encumber the Property. Trustee will preserve the title to the Property and the validity and priority of this Trust and will forever warrant and defend the same for the Beneficiary against the claims of all persons. If the Trustor has a leasehold interest in the Property, the Trust will not apply to the last day of the term of the Lease or the term of any renewal or replacement of the Lease. The Trustor will hold the last day of each term in trust for the Beneficiary and transfer it on his direction to any person acquiring such term. the Trustor will renew the Lease as necessary to protect the Beneficiary's interest and the Trust will extend to any such renewal. The Trustor agrees that the Property includes all property of any kind that is now or at any time in the future attached or fixed to the land or buildings or placed on and used in connection with them, as well as all alterations, additions and improvements to the buildings. The Trustor will pay all taxes and other rates levied on the Property and all accounts for utilities supplied to the Property and all charges, trusts, liens and other encumbrances on the Property when they are due and comply with his other obligations under them. Upon the Beneficiary's request, the Trustor will immediately give receipts showing that the taxes and other accounts have been paid. The Trustee will not sell, transfer, lease or otherwise dispose of all or any part of the Property or any interest in the Property, or if a corporation, permit a change in control, without the Trustor's and Beneficiary's prior written approval and if approved, without such approved purchaser, transferee or lessee entering an assumption agreement in form satisfactory to the Beneficiary. Acceptance of any payments from a purchaser, transferee or lessee or after a change in control not approved in writing, will not constitute an approval or waiver by the Beneficiary. Trustor will insure in the Beneficiary's favor all buildings on the Property that are the subject of the Trust. The insurance will include protection against damage by fire and other perils including "extended peril coverage" and any other perils that the Beneficiary requests. The insurance must cover replacement costs of any buildings on the Property in US dollars. The Trustor will choose the insurance company subject to the Beneficiary's right to disapprove. The insurance policies will include a standard trust clause stating that any loss is payable to the Beneficiary. This Trust will be enough proof for any insurance company to pay any claims to the Beneficiary and to accept instructions from the Beneficiary regarding any insurance claims. renewal notices and evidence of renewal completion. In the event of loss, the Trustor will provide prompt notice to the Beneficiary and the insurance carrier. The Trustor will provide the Beneficiary with proof of all claims at the Trustor's own expense and do all necessary acts to enable the Trustor to obtain all insurance proceeds from the claim. The insurance proceeds, in whole or in part, will be applied to the restoration and repair of the Property, if the restoration and repair is economically feasible. If the restoration and repair is not economically feasible, the insurance proceeds will be applied to the remainder of the Trust, whether or not the balance of the Trust is then due. Any remaining funds from the insurance claim will be paid to the Trustor. The Trustor will maintain the Property in good order, condition and repair and will promptly make all necessary repairs, replacements, and improvements. The Trustor will not allow the Property to become or remain vacant without the written consent of the Beneficiary. The Trustor will not commit waste and will not remove, demolish or materially alter the Property or any part of it without prior written consent from the Beneficiary. The Beneficiary may, whenever necessary, enter upon and inspect the Property. If the Trustor, or anyone claiming under the Trustor, neglect to keep the Property in good condition and repair, or commit any act of waste on the Property, or do anything by which the value of the Property is diminished, as to all of which the Beneficiary will be sole judge, the Beneficiary may (but is not obliged to) enter the Property and effect such repairs or work as it considers necessary. The Trustor will not use, store, release, deposit, recycle, or permit the presence of hazardous substances on the Property, generally accepted items for residential use excepted, which includes but not limited to asbestos, PCBs, radioactive materials, gasoline, kerosene, or other flammable petroleum products (the "Hazardous Substances"). The Trustor is also prohibited from performing any acts on the Property involving any Hazardous Substances that would materially affect the value of the Property or would require clean-up or remedial action under federal, state, or local laws and codes. Until default by the Trustor under this Trust, the Trustor will have quiet possession and receive the rents and profits from the Property. if the Property or a material part of the Property is expropriated. If at any time the Trustor should be in default under this Trust, then the Principal Amount, interest and all amounts secured by this Trust will, at the option of the Beneficiary, become due and payable immediately. If at any time the Trustor is in default and the Beneficiary does not require the Trustor to pay immediately in full as described above, the Beneficiary will retain the right to seek full immediate payment if the Trustor is in default at a later time. Any forbearance on the part of the Beneficiary upon default, which includes but not limited to acceptance of late payment, acceptance of payment from third parties, or acceptance of payments less than the amount then due, will not constitute as waiver to enforce acceleration on default. In the event that the Beneficiary elects to accelerate the Trust, the Beneficiary will provide notice to the Trustor in accordance with Applicable Law. The Trustor may be charged with fees in association with the default of this Trust or for the protection of the Beneficiary's interest for this Trust, which may include, but is not limited to attorneys' fees and property inspections (the "Additional Fees"). The absence of specific charges which may be levied against the Trustor in this Trust does not preclude the Beneficiary from charging such costs as Additional Fees. However, the Beneficiary will not charge any fees which are prohibited by Applicable Law and the Beneficiary will not charge any fees above and beyond the amount or percentage allowed under the Applicable Law. Any amount disbursed by the Beneficiary in relation to the protection of the Beneficiary's security will become Additional Fees payable by the Trustor. The Additional Fees will carry an interest rate of _______________ percent per annum, compounding annually. The Additional Fees' total including interest will become due upon written request by the Beneficiary. payment of reasonable costs in repairing and maintaining the Property. Any action referred to in this section is optional for the Beneficiary and the Beneficiary has no duty or obligation to carry out any of the remedies listed in this section and will not incur any liability in the failure to perform such tasks. Any amount disbursed by the Beneficiary in relation to the protection of the Beneficiary's security will become Additional Fees payable by the Trustor. If at any time the Trustor should be in default under this Trust, the Beneficiary will have the right to foreclose and force the sale of the Property without any judicial proceeding. Any delay in the exercising of this right will not constitute as waiver on the part of the Beneficiary to exercise this option at a subsequent time should the Trustor remains in default or if the Trustor becomes default again in the future. The Beneficiary will have the right to pursue all remedies for the collection of the amounts owing on this Trust that are provided for by Applicable Law (both federal and state), whether or not such remedies are expressly granted in this Trust, including but without limitation foreclosure proceedings. If the Beneficiary invokes the power of sale, the Beneficiary will cause the Trustee to execute a written notice of the event of default and the Beneficiary's election to sell the Property. The Beneficiary or the Trustee will mail copies of the notice as prescribed by Applicable Law to Trustor and other persons as required by Applicable Law. The Trustee will give public notice of sale to the Trustor in the manner provided for by Applicable Law. After the time required by Applicable Law, the Trustee, without demand on the Trustor, will sell the Property at public auction to the highest bidder, at the time and place and subject to the terms indicated in the notice of sale. The Trustee may postpone sale of the Property by public announcement at the time and place of any scheduled sale. Headings are inserted for the convenience of the parties to the Trust and are not to be considered when interpreting this Agreement. Words in the singular mean and include the plural and vice versa. Words in the masculine gender mean and include the feminine gender and vice versa. Words importing persons include firms and corporations and vice versa. If any provision of this Trust will be held invalid or be prohibited by the Applicable Law, such provision will not invalidate the remaining provisions of this Trust and such provisions of the Trust will be amended or deleted as necessary to comply with the Applicable Law. Nothing contained in this Trust will require the Trustor to pay or for the Beneficiary to accept interest in an amount greater than that allowed by Applicable Law. If the payment of interest or other amounts under this Trust would otherwise exceed the maximum amount allowed under Applicable Law or violate any law as to disclosure or calculation of interest charges, then the Trustor's obligations to pay interest or other charges will be reduced or amended to the maximum rate or amount permitted under Applicable Law. If the Trustor is more than one person or legal entity, each person or legal entity who signs it will be jointly and severally bound to comply with all covenants and obligations of the Trustor and the said covenants and obligations will bind all of the Trustor's successors and permitted assigns. The Trust will enure to the benefit of the Beneficiary and the Beneficiary's successors and assigns. The covenants contained in this Trust are additional and supplemental, to the extent permitted by law, the covenants set out in the Applicable Law regarding trusts. The Beneficiary may, at its option, from time to time appoint a new Trustee by an instrument executed and acknowledged by the Trustor and recorded in the office of the Recorder of the county in which the Property is located. The instrument will contain the name of the original Beneficiary, Trustee, and Trustor, the book and page where the Trust is recorded and the name and address of successor trustee. The successor trustee will succeed to all the title, powers, and duties conferred upon the Trustee. where the person is a corporation, by so delivering or sending it to the last known address or number of a director, officer, employee or attorney of the corporation. Any party in this instrument whose address has changed are responsible for notifying the other respective parties of the change in address. Any notice or demand delivered as described will constitute as sufficient delivery. Any notice, demand, mail and facsimile (the "Notice") made will constitute as being effective on the same day that it was sent, unless the day in which the Notice was sent falls on a national holiday, Saturday or Sunday, in which case, the next business day would be considered as the day of receipt. The foregoing instrument was acknowledged before me this 21st day of April, 2019, by _________________________. A Deed of Trust, also known as a trust deed, is used to secure a loan for real property (immovable property like land or a house). When using a trust deed, legal title to a property is transferred from the lender to a neutral trustee until the borrower pays off the loan. Once repayment is complete, the legal title transfers from the trustee to the borrower, and the transaction is complete. One of the main differences between a Mortgage Agreement and a Deed of Trust is the parties who are involved in the transaction. The borrower: the party receiving a loan to pay off their house, condo, apartment, etc. A trust deed can also include a guarantor, a person who is jointly responsible for the loan repayment if the trustor defaults. This provides extra security for the lender because they'll have another avenue to collect on the loan if needed. Another difference is that a Deed of Trust always has a power of sale clause that grants the beneficiary the right to foreclose on the property should the trustor default. In this event, the trustee will conduct a non-judicial foreclosure (a sale of the property without the requirement of a court order). Which states use a Deed of Trust? Some states require the use of a specific security instrument, meaning a Deed of Trust or a Mortgage Agreement. Idaho and Washington, D.C. require the use of a trust deed. Connecticut, Delaware, Florida, Illinois, Indiana, Iowa, Kansas, Kentucky, Louisiana, Maine, Nebraska, New Jersey, New Mexico, North Dakota, Ohio, Pennsylvania, and South Carolina require the use of a Mortgage Agreement. The rest of the states may use one or the other. Who can I use as a trustee in a Deed of Trust? In a Deed of Trust, the trustee is a neutral third-party who holds the legal title of the property as security for the loan until the lender's money is repaid or the borrower defaults. Trustees are sometimes referred to as escrow agents. Escrow is the process of a third-party securing a transaction (in the case of the sale of real estate, they are holding the title of the property until the loan agreement is satisfied or dissolved). Usually the escrow agent (trustee) is an attorney or a title company. A title company ensures that the title to real estate is legitimate, and they insure the property. Title insurance shields the lender and borrower from potential lawsuits that arise from disputes over the title. How do I fill out a Deed of Trust?